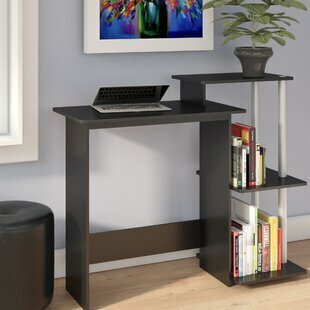 This Workpad Standing Desk offers a unique, simplistic, yet contemporary design. You are able to move from a sitting to a standing position with the push of a button, which makes it great for your home, office, dorm or workspace. 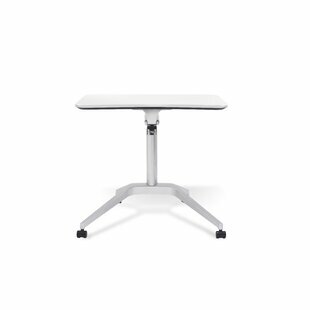 The Workpad Standing Desk table has wheels, which makes moving the table around a breeze while still accomplishing your daily tasks. The top feature an ergonomic curve and the castors are locking. Assembly Required: Yes Overall: 40 H x 27.5 W x 19 D Overall Product Weight: 30lb. 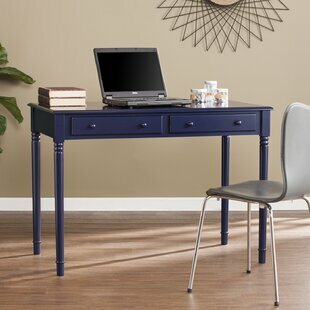 This Classy Desk with Three Drawers combines style and quality with a simple design made of heavy-duty particle board panels with a moisture resistant paper laminate finish. This ultra modern design features an expansive contoured desktop shape. The under table side shelf and three drawers provide optimal storage. Assembly Required: Yes Overall: 29.5 H x 51.2 W x 23.6 D Overall Product Weight: 75lb. 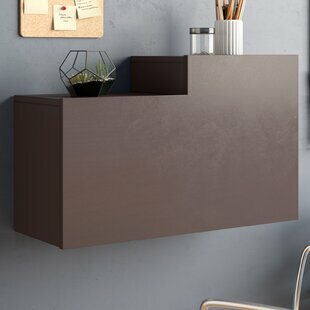 The Techni Mobili Fashionable Workstation with shelf and storage combines style and quality with a simple design made of heavy-duty particle board panels with a moisture resistant paper laminate finish. 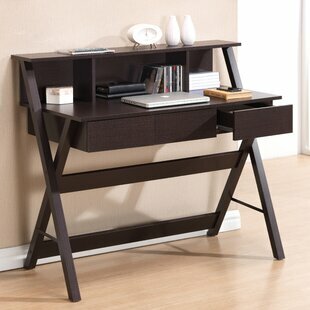 This desk is a great for use with a laptop, a tablet or just as a writing workstation. Assembly Required: Yes Overall: 38.7 H x 44 W x 22 D Overall Product Weight: 56lb. 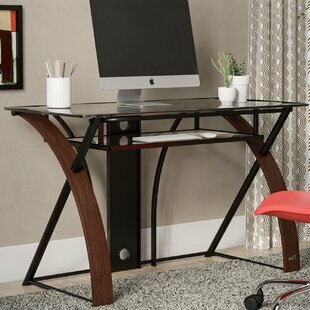 Whether youre often working from home or just need a designated spot for web surfing, this computer desk is the perfect pick. Understated in its design, it is crafted from scratch-, stain- and heat-resistant laminated melamine with a clean-lined silhouette and a neutral solid finish. The top is ideal for setting your screen, while a pull-out drawer below lends space for a keyboard and mouse. 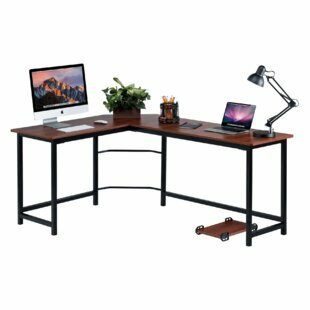 For additional space to stow office supplies, youll find five open shelves and a single arch... Base Material Details: Solid engineered wood Assembly Required: Yes Overall: 61.81 H x 47.25 W x 19.69 D Overall Product Weight: 87.9lb. 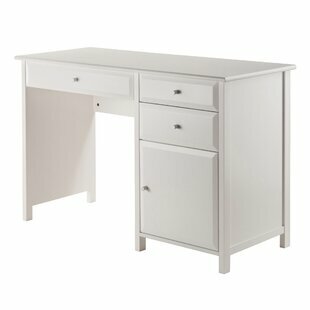 Start styling the study in timeless simplicity with this classic computer desk. 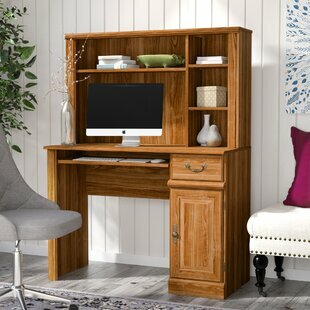 Made in the USA, it is crafted of manufactured wood and features a clean-lined design with pleasant paneled details and a Carolina oak finish. Darker wood grain details lend a splash of rustic charm, while brass-finished hardware ties it all together in timeless style. Pull up a stately leather arm chair for a touch that will instantly elevate, roll out a woven wool rug on the floor below, and add on a polished... Assembly Required: Yes Overall: 56.299 H x 42.598 W x 19.449 D Product Warranty: 5 years Overall Product Weight: 102lb. 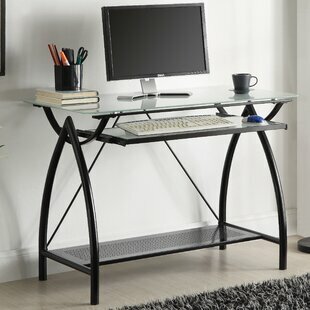 Whether youre often working from home or just need a designated spot for web surfing, this computer desk is the perfect pick. Understated in its design, it is crafted from manufactured wood with a clean-lined silhouette and a neutral solid finish. The top is ideal for setting your screen, while a pull-out drawer below lends space for a keyboard and mouse. Off to the side, youll find a convenient printer shelf and an arch handle-adorned drawer for tucking away essential office supplies. Assembly Required: Yes Overall: 34.02 H x 39.61 W x 19.45 D Product Warranty: 1 year Overall Product Weight: 52lb. Proving that sleek, contemporary style can come in small packages, this compact writing desk features a streamlined silhouette thats a fine fit for the fashion-forward home office. 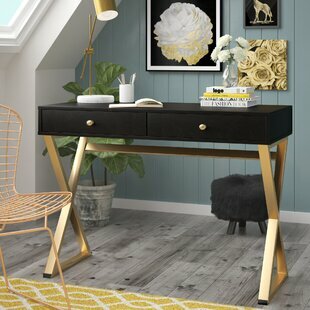 Crafted from a mix of solid and manufactured wood, its x-shaped base boasts a shimmering gold finish that adds a touch of drama, while the desk itself is awash in black and accented by gold hardware. 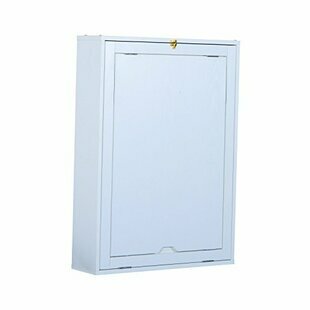 For storage, two drawers on metal glides offer out-of-sight storage for pens, pencils, and more. Measures 31 H x... Top Material Details: Veneers Assembly Required: Yes Overall: 31 H x 20 H x 42 W x 19 D Overall Product Weight: 121lb. 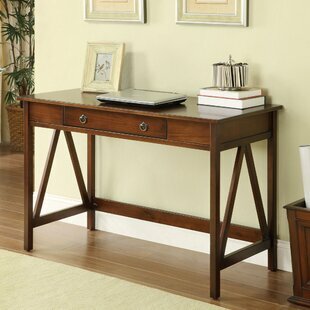 Get your work down at home and in style with this charming Antioch Desk with Hutch. 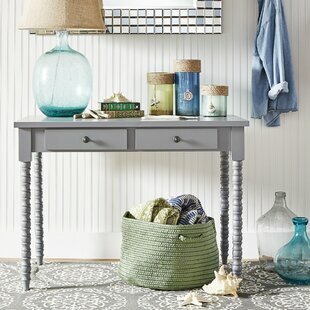 A perfect blend of form and function, this piece brings ample storage space and classic appeal to your space. The sleek black finish and clean-lined design let this piece fit in with a variety of settings, while the two silver beads add a touch of chic flair. 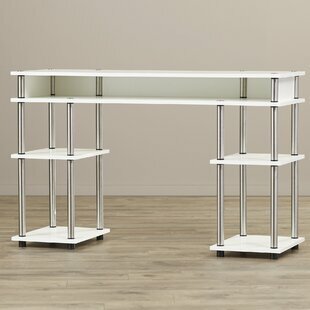 It also features a large rectangular tabletop and three open shelves for all your storage needs. 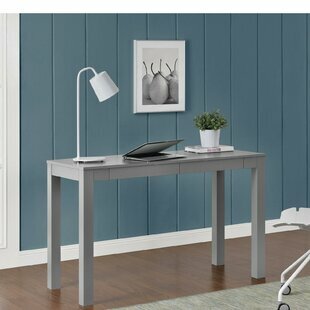 Try setting this desk at the center of your home study to... Base Material Details: Solid wood and MDF Assembly Required: Yes Overall: 33.6 H x 39.6 W x 15.6 D Product Warranty: 1 Year Overall Product Weight: 22lb. 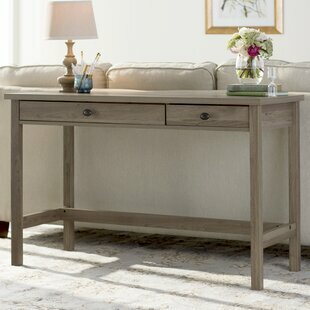 Make the most of your existing space with their stylish and affordable fold-out convertible desk. It doubles as a working surface and storage area anywhere you need it. Transform an empty spot into your own personal work, study or writing area. 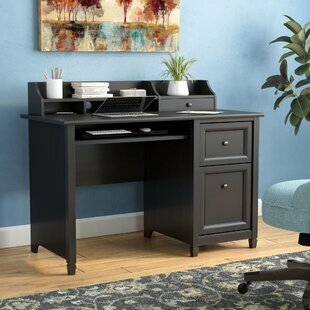 If youve been wishing for more room to get things done or just want to clean up some clutter around your home, this lightweight and convenient desk provide a neat and orderly solution. When space is limited, this is big on ideas to maximize your living... Assembly Required: Yes Overall: 58 H x 37 W x 23.5 D x 6.5 D Product Warranty: 90 Days Overall Product Weight: 40lb. 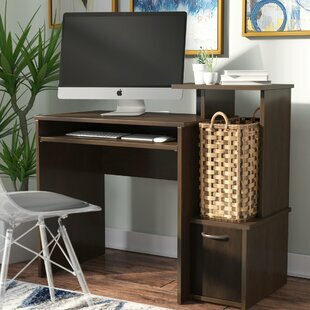 This simplistic easy computer desk combines the design of turn-n-tube and simple design to provide a unit that fit in your space, your style and fit on your budget. It is easily assembled and blends into any of your home decors. This unit features a pull out drawer for keyboard and mouse. Assembly Required: Yes Overall: 28.75 H x 31.5 W x 15.75 D Product Warranty: 1 Year Overall Product Weight: 22lb. 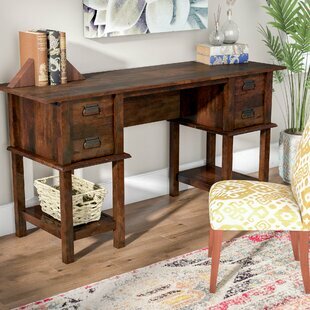 Understated, sleek, and perfect in the home office or master suite, this wood writing desk is the perfect piece to craft a chic work space for DIY projects and outlining novel drafts. Assembly Required: Yes Overall: 30.03 H x 25 H x 47.16 W x 19.44 D Product Warranty: 5 Year Overall Product Weight: 64lb. 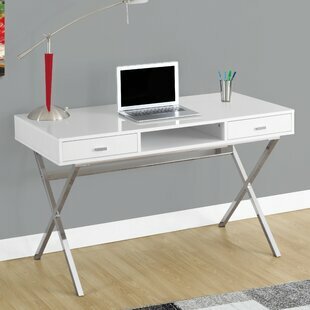 Anchor your home office in traditional simplicity with this cleanly-designed computer desk. Crafted of composite wood with solid wood veneers in a clean, classic finish, this dapper design features simple molding, recessed panel sides, beveled drawer and door faces, and contemporary pulls. One wide center drawer and two side drawers sit on smooth-operated metal glides, offering out-of-sight storage for office supplies and accessories, while one lower cabinet can store books, binders, folders... Base Material Details: MDF and veneer Assembly Required: Yes Overall: 30.71 H x 47.24 W x 20.24 D Product Warranty: 1 Year Overall Product Weight: 93.7lb. 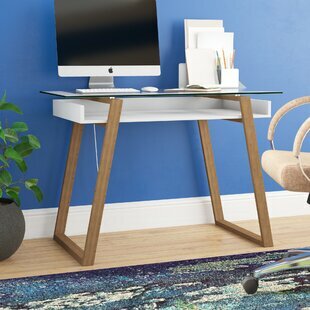 Drawing inspiration from architectural designs, this clean-lined computer desk anchors your office in contemporary style. 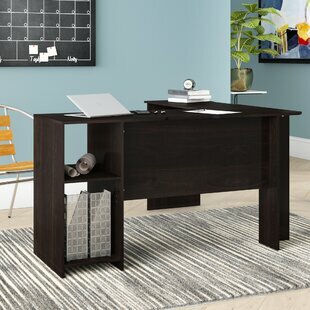 Founded atop an open steel frame with high-gloss black posts and curved wooden sides, this piece features a tinted tempered glass top that provides space to spread out as you tackle your to-do list. An espresso finish outfits the wooden accents for a touch of warmth. Below, youll find a convenient keyboard tray so you can tuck away a few essentials with ease. Overall: 30 H x 47 W x 24 D Overall Product Weight: 65lb. 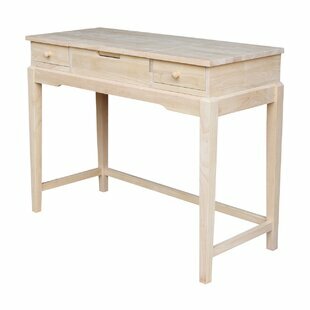 Home office clutter, your days are numbered; with this writing desk, storage options abound. 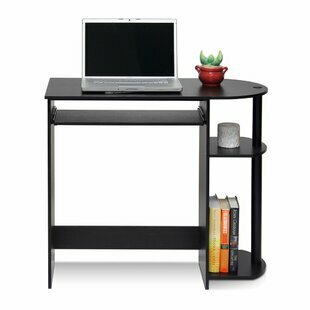 Held together by stainless steel poles, this desk brims with sleek ultramodern style, while four open shelves and a spacious top cubby, each crafted from wood grain board, provide a convenient spot for books, bins, baskets, and beyond. Plus, it assembles with ease so you can get back to tackling your to-dos. All of this at a budget-friendly price whats not to love? Base Material Details: Stainless steel Assembly Required: Yes Overall: 30 H x 47.25 W x 15.75 D Overall Product Weight: 41lb.